Chhattisgarh Swami Vivekananda University, (CSVTU) has declared the Diploma 3rd Sem (Regular & Backlog) and 4th Sem (Backlog) Exam Results 2013 held in the month of November-December 2012 on 15th March 2013. The Last date for submission of Revaluation/Retotaling forms is 25th March 2013. 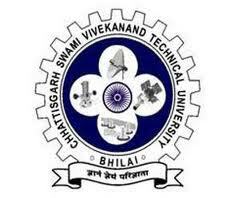 Chhattisgarh Swami Vivekanand Technical University (CSVTU) has been established by an Act(No.25 of 2004) of Legislature passed by the Chhattisgarh State Govt. Assembly, wide notification No.639/21-A/Prarupan/2004 date 21st Jan 2005 and published in the State Govt. gazette 24th January, 2005. The University incorporates the purpose of ensuring systematic, efficient and qualitative education in engineering and technological subjects including Architecture and Pharmacy at Research, Postgraduate, Degree and Diploma level. The foundation stone of the University was laid down by Honorable Dr. Manmohan Singh, the Prime Minister, Govt. of India on April 30th 2005.